Come to the library! We are here to support your studies. 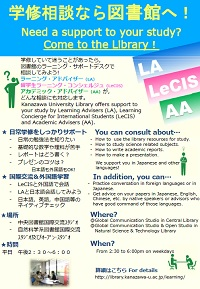 ※ Learning Support Desk will be held until 3rd August (Fri). LA and LeCIS members support general learning activities and studies of basic level science subjects in English and in their native languages. Circumstances may require modification of their schedule.